Disclaimer: This is not an exhaustive explanation. This was written to help Christians understand the concepts and ideas of the trinity that are considered “orthodox” in accordance with the church’s history. It is also not intended to provide textual proofs for each aspect presented here. This is not because anything presented here is not textually consistent but because of time, space, and believe it or not, for the sake of brevity. If you are interested in an aspect of the Trinity and would like some scripture to investigate the issue for yourself then please contact me at thenerdytheologian@gmail.com. The trinity is one of Christianity’s oldest and most mysterious doctrines. It has been a topic of much discussion and was in fact one of the first theological areas that theologians attempted to flush out. I’m not going to go into all of that here (mostly because a few books could be written on the topic) but the point I am trying to make ring home is that throughout the church’s history, this has been a topic of importance to the church. For this very reason, it is something worth understanding (as best we can). Now, if this was my only argument for learning about the trinity is, than I would have a weak argument (granted). Thankfully, that is not the case. For me, the trinity is perhaps the single most important doctrine for Christians to understand. Its tenants tell us who God is, but it also tells us how we should treat one another in the body of Christ. It tells us that we are called to submission, humility, and the honoring of others within community. It also tells us that community is a natural and divinely designed part of what it means to be human. The trinity is traditionally articulated in two ways; the ontological trinity, and the economic trinity. With each term I will define, and then briefly explain what is meant when we use these terms in relation to the trinity. Ontology is the study of being. It is a philosophical study of existence and nature. In light of this, we look at what the trinity is in its being, and nature. To begin it is worth pointing out that there is a lot of church history with regard to this issue. The early church felt that this was so important that it spent a significant amount of time trying to articulate it in a way that was both biblically sound and theologically consistent (Hall, 2002). Having said this, I am not using any one theologian or explanation as a “go to” but am going to try to explain the mystery that is the trinity as plainly as possible. God in His very being is a singular being. The first person pronoun “I” or “me” are used quite frequently in the biblical narrative to convey the personhood and being of God as a singular person. Having said this, it is interesting to see that in Genesis 1:26 God refers to Himself in the first person plural using “us” or “we” to describe Himself. It is also worth noting that in the following verse the writer uses the third person singular pronoun “him” to describe the creative activity of God. Now this may be splitting hairs, but I’m thinking that isn’t likely, especially since this same phenomenon occurs in Genesis 3:22 and in 11:7. In Genesis God speaks to Himself, this is either an indication that God is crazy, or that God’s being is more nuanced than the human mind can perceive. God is a non-corporeal being, which means that God’s being is not bound by the boundaries of flesh or the laws of the natural universe. 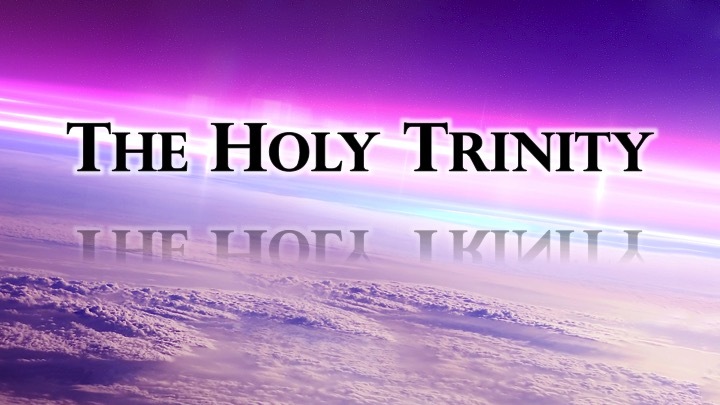 God then, reveals Himself as three distinct persons in the Father, the Son, and the Holy Spirit. Notice what I have written here, “distinct”. God the Father is not God the Son, God the Son is not God the Holy Spirit and so forth. They are three eternally coexisting persons. So how then can God state that he is one God since there are in reality three persons involved? God is revealed to us as three persons, but these three persons are of the same essence or substance as the other. Not only this, but all three are in and of themselves completely and totally God in His fullness. It is not as though each holds a third of the authority, oh no, they all hold all authority together in perfect fellowship and love for one another. God then is a singular being comprised of three distinct persons, all of which hold total and complete authority over all things. On the level of existence, permanence, and value, each member of the Godhead is equally as valuable, equally as powerful, and equally as eternal as the other, and all together gives us an insight into the inner workings of the divine mind. This (believe it or not) is the easier part of Trinitarian theology. Since God the Father, Son and Holy Spirit are eternally co-existent, and of equal power and value, why then does Scripture show Jesus praying to God the Father, and the Holy Spirit working in obedience to the Father and the Son? With the understanding of the above in mind, it is important to understand that in relationship roles are to be played. Within the Godhead, we see an order to how God functions within the universe. God the Father then sits at the head, sending the Son to redeem all of creation. God the Father and God the Son then sends the Holy Spirit to abide in the human person, sealing them for salvation which will find its culmination at the end of all things. This does not mean that the Father subjugates the Son and that the Father and the Son subjugate the Spirit. The Son subjugates Himself to the Father and the Holy Spirit subjugates Himself to the Father and the Son. For this, the Spirit in all His fullness resides within His Church, which is now His temple, His people, His home. The Son, for His pivotal role in the redemption of all things is given the throne of heaven, ruling and reigning over all things. What is interesting in this is that no member of the Godhead keeps these things for themselves, but in everything shares equally. God then delights in humbling Himself to Himself making God by His very nature humble. Within the Trinitarian relationship then, is the constant act of humbling, serving, and loving. It is perfect relationship personified if the very being that is God. Here is why all of this is important for us to know, understand, and be able to articulate. The God of the Bible is a being who in His very person gives us a road map for how human beings are to relate to one another. The Law of God then is not found in Torah, but in the person, being, and nature of God Himself. God calls His people to act in loving, humble, service to one another, not counting ourselves as important as others. We see this lived out in the relationship between Father, Son, and Spirit within the scriptures, which is why He found it good to reveal it to us. So, you see, the trinity is actually one of the most practical theologies of them all in that within its very tenants are a guide to how we live our lives with one another. Not only this, but in it we see that Jesus being God in His fullness was crucified and killed as a perfect offering for sin. This is more than a blood sacrifice (although the symbolism is there) it is the payment of a light that should have never been extinguished in favor of all other lights that did. In this then God rights our wrong by suffering injustice, He takes upon Himself our punishment and in so doing, defeats its power over the universe. We also learn that by having the Holy Spirit dwell within us, we have within us the very power of God to overcome all obstacles and persevere any suffering. Within us, resides the creator of all things and in that we are to take comfort. Comfort in that we are never alone, that we are never abandoned, that we are never forgotten. Without an understanding of the trinity, we fail to understand that the King of all things resides within us and empowers us to go out into all the world with all strength and might to beat on the gates of hell, advancing the kingdom of heaven until the return of our Lord. I pray that you find this as an encouragement and that you take to heart what was written today. The trinity is a theological wonder to behold, a marvel of divine revelation and in understanding it, we come to know Him just a little bit better. Peace and Blessings, and as always thank you for reading.